We all long for blissful relationships. No matter how many attempts you have made in the past to find ''the one'' - or how many breakups you may have had - if you are still determined to get another shot at finding or attracting your true soul mate, let ReLovenship: Look Within to Love Again! be your next step. For authors and relationship coaches Mario P. Cloutier and Diane Sawaya Cloutier, finding your soul mate - or ''the one'', as some refer to this person - can't be left solely to chance or to 'wishful thinking; it takes dedication and a mind-set shift. Blending practicality and spirituality, this workbook is filled with tips, suggestions, and methodologies to find a blissful relationship. 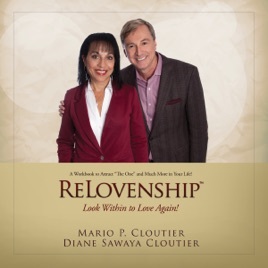 The authors of ReLovenship: Look Within to Love Again! both have their own ways of describing the process they went through to find what they were looking for - as long as you are willing to look inside of you first!